Apostle Paul: same as Saul (which see) was born about the same time as our Lord. His circumcision-name was Saul, and probably the name Paul was also given to him in infancy "for use in the Gentile world," as "Saul" would be his Hebrew home-name. He was a native of Tarsus, the capital of Cilicia, a Roman province in the south-east of Asia Minor. That city stood on the banks of the river Cydnus, which was navigable thus far; hence it became a centre of extensive commercial traffic with many countries along the shores of the Mediterranean, as well as with the countries of central Asia Minor. It thus became a city distinguished for the wealth of its inhabitants. Tarsus was also the seat of a famous university, higher in reputation even than the universities of Athens and Alexandria, the only others that then existed. Here Saul was born, and here he spent his youth, doubtless enjoying the best education his native city could afford. His father was of the straightest sect of the Jews, a Pharisee, of the tribe of Benjamin, of pure and unmixed Jewish blood (Acts 23:6; Philippians 3:5). We learn nothing regarding his mother; but there is reason to conclude that she was a pious woman, and that, like-minded with her husband, she exercised all a mother influence in moulding the character of her son, so that he could afterwards speak of himself as being, from his youth up, "touching the righteousness which is in the law, blameless" (Philippians 3:6). We read of his sister and his sister's son (Acts 23:16), and of other relatives (Romans 16:7,11,12). Though a Jew, his father was a Roman citizen. How he obtained this privilege we are not informed. "It might be bought, or won by distinguished service to the state, or acquired in several other ways; at all events, his son was freeborn. It was a valuable privilege, and one that was to prove of great use to the apostle Paul, although not in the way in which his father might have been expected to desire him to make use of it." Perhaps the most natural career for the youth to follow was that of a merchant. "But it was decided that...he should go to college and become a rabbi, that is, a minister, a teacher, and a lawyer all in one." This was the moment of his conversion, the most solemn in all his life. Blinded by the dazzling light (Acts 9:8), his companions led him into the city, where, absorbed in deep thought for three days, he neither ate nor drank (Acts 9:11). 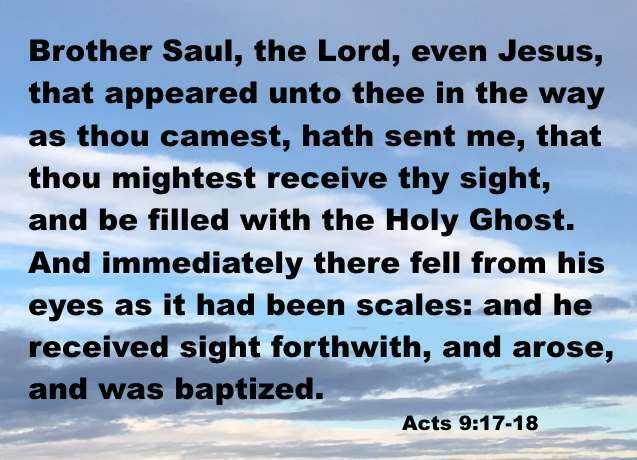 Ananias, a disciple living in Damascus, was informed by a vision of the change that had happened to Saul, and was sent to him to open his eyes and admit him by baptism into the Christian church (Acts 9:11-16). The whole purpose of his life was now permanently changed. Immediately after his conversion he retired into the solitudes of Arabia (Galatians 1:17), perhaps of "Sinai in Arabia," for the purpose, probably, of devout study and meditation on the marvellous revelation that had been made to him. "A veil of thick darkness hangs over this visit to Arabia. Of the scenes among which he moved, of the thoughts and occupations which engaged him while there, of all the circumstances of a crisis which must have shaped the whole tenor of his after-life, absolutely nothing is known. 'Immediately,' says St. Paul, 'I went away into Arabia.' The historian passes over the incident [comp. 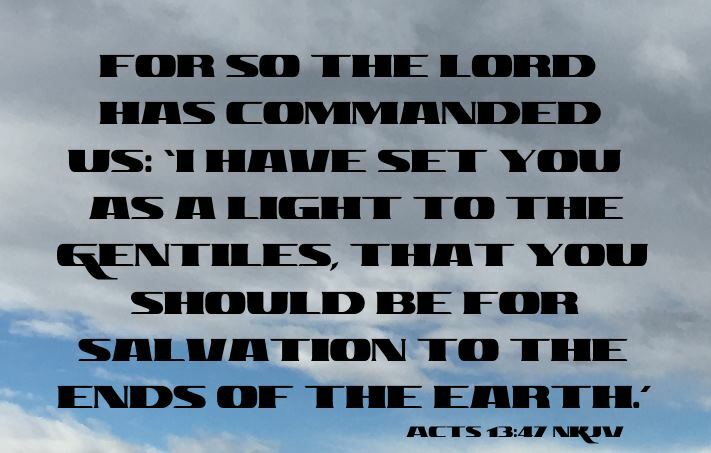 Acts 9:23 and 1 Kings 11:38,39]. It is a mysterious pause, a moment of suspense, in the apostle's history, a breathless calm, which ushers in the tumultuous storm of his active missionary life." Coming back, after three years, to Damascus, he began to preach the gospel "boldly in the name of Jesus" (Acts 9:27), but was soon obliged to flee (Acts 9:25; 2 Corinthians 11:33) from the Jews and betake himself to Jerusalem. Here he tarried for three weeks, but was again forced to flee (Acts 9:28,29) from persecution. He now returned to his native Tarsus (Galatians 1:21), where, for probably about three years, we lose sight of him. The time had not yet come for his entering on his great life-work of preaching the gospel to the Gentiles. At length the city of Antioch, the capital of Syria, became the scene of great Christian activity. 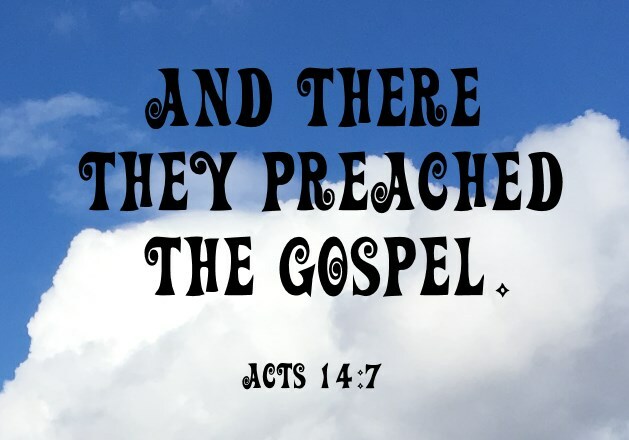 There the gospel gained a firm footing, and the cause of Christ prospered. Barnabas (which see), who had been sent from Jerusalem to superintend the work at Antioch, found it too much for him, and remembering Saul, he set out to Tarsus to seek for him. He readily responded to the call thus addressed to him, and came down to Antioch, which for "a whole year" became the scene of his labours, which were crowned with great success. 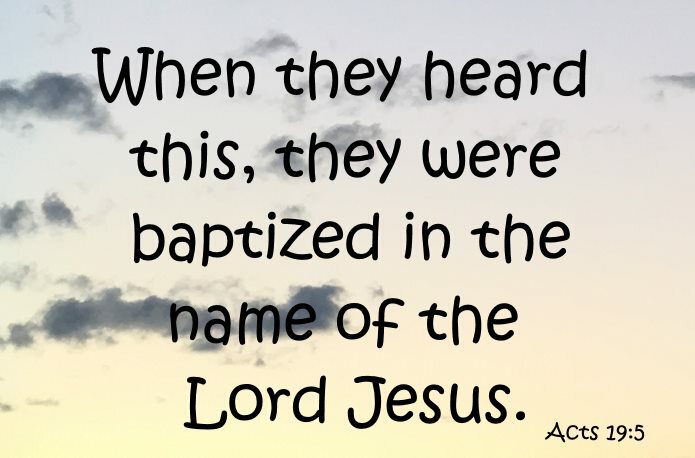 The disciples now, for the first time, were called "Christians" (Acts 11:26). The three missionaries went forth on the first missionary tour. They sailed from Seleucia, the seaport of Antioch, across to Cyprus, some 80 miles to the south-west. Here at Paphos, Sergius Paulus, the Roman proconsul, was converted, and now Saul took the lead, and was ever afterwards called Paul. The missionaries now crossed to the mainland, and then proceeded 6 or 7 miles up the river Cestrus to Perga (Acts 13:13), where John Mark deserted the work and returned to Jerusalem. The two then proceeded about 100 miles inland, passing through Pamphylia, Pisidia, and Lycaonia. The towns mentioned in this tour are the Pisidian Antioch, where the apostle Paul delivered his first address of which we have any record (Acts 13:16-51; comp. Acts 10:30-43), Iconium, Lystra, and Derbe. They returned by the same route to see and encourage the converts they had made, and ordain elders in every city to watch over the churches which had been gathered. From Perga they sailed direct for Antioch, from which they had set out. After remaining "a long time", probably till A.D. 50 or 51, in Antioch, a great controversy broke out in the church there regarding the relation of the Gentiles to the Mosaic law. For the purpose of obtaining a settlement of this question, Paul and Barnabas were sent as deputies to consult the church at Jerusalem. The council or synod which was there held (Acts 15:1-41) decided against the Judaizing party; and the deputies, accompanied by Judas and Silas, returned to Antioch, bringing with them the decree of the council. After a short rest at Antioch, Paul said to Barnabas: "Let us go again and visit our brethren in every city where we have preached the word of the Lord, and see how they do." Mark proposed again to accompany them; but the apostle Paul refused to allow him to go. Barnabas was resolved to take Mark, and thus he and the apostle Paul had a sharp contention. They separated, and never again met. Paul, however, afterwards speaks with honour of Barnabas, and sends for Mark to come to him at Rome (Colossians 4:10; 2 Timothy 4:11). Paul took with him Silas, instead of Barnabas, and began his second missionary journey about A.D. 51. This time he went by land, revisiting the churches he had already founded in Asia. But he longed to enter into "regions beyond," and still went forward through Phrygia and Galatia (2 Timothy 16:6). Contrary to his intention, he was constrained to linger in Galatia (which see), on account of some bodily affliction (Galatians 4:13,14). Bithynia, a populous province on the shore of the Black Sea, lay now before him, and he wished to enter it; but the way was shut, the Spirit in some manner guiding him in another direction, till he came down to the shores of the Aegean and arrived at Troas, on the north-western coast of Asia Minor (Acts 16:8). Of this long journey from Antioch to Troas we have no account except some references to it in his Epistle to the Galatians (Gal 4:13). As he waited at Troas for indications of the will of God as to his future movements, he saw, in the vision of the night, a man from the opposite shores of Macedonia standing before him, and heard him cry, "Come over, and help us" (Acts 16:9). 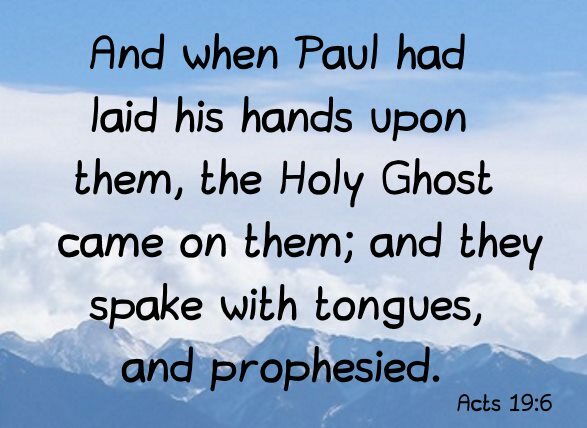 The apostle Paul recognized in this vision a message from the Lord, and the very next day set sail across the Hellespont, which separated him from Europe, and carried the tidings of the gospel into the Western world. In Macedonia, churches were planted in Philippi, Thessalonica, and Berea. Leaving this province, the apostle Paul passed into Achaia, "the paradise of genius and renown." He reached Athens, but quitted it after, probably, a brief sojourn (Acts 17:17-31). The Athenians had received him with cold disdain, and he never visited that city again. He passed over to Corinth, the seat of the Roman government of Achaia, and remained there a year and a half, labouring with much success. While at Corinth, he wrote his two epistles to the church of Thessalonica, his earliest apostolic letters, and then sailed for Syria, that he might be in time to keep the feast of Pentecost at Jerusalem. He was accompanied by Aquila and Priscilla, whom he left at Ephesus, at which he touched, after a voyage of thirteen or fifteen days. He landed at Caesarea, and went up to Jerusalem, and having "saluted the church" there, and kept the feast, he left for Antioch, where he abode "some time" (Acts 18:20-23). Very shortly before his departure from Ephesus, the apostle Paul wrote his First Epistle to the Corinthians (which see). The silversmiths, whose traffic in the little images which they made was in danger, organized a riot against the apostle Paul, and he left the city, and proceeded to Troas (2 Corinthians 2:12), whence after some time he went to meet Titus in Macedonia. Here, in consequence of the report Titus brought from Corinth, he wrote his second epistle to that church. Having spent probably most of the summer and autumn in Macedonia, visiting the churches there, especially the churches of Philippi, Thessalonica, and Berea, probably penetrating into the interior, to the shores of the Adriatic (Romans 15:19), he then came into Greece, where he abode three month, spending probably the greater part of this time in Corinth (Acts 20:2). During his stay in this city he wrote his Epistle to the Galatians, and also the great Epistle to the Romans. At the end of the three months he left Achaia for Macedonia, thence crossed into Asia Minor, and touching at Miletus, there addressed the Ephesian presbyters, whom he had sent for to meet him (Acts 20:17), and then sailed for Tyre, finally reaching Jerusalem, probably in the spring of A.D. 58. While at Jerusalem, at the feast of Pentecost, he was almost murdered by a Jewish mob in the temple. 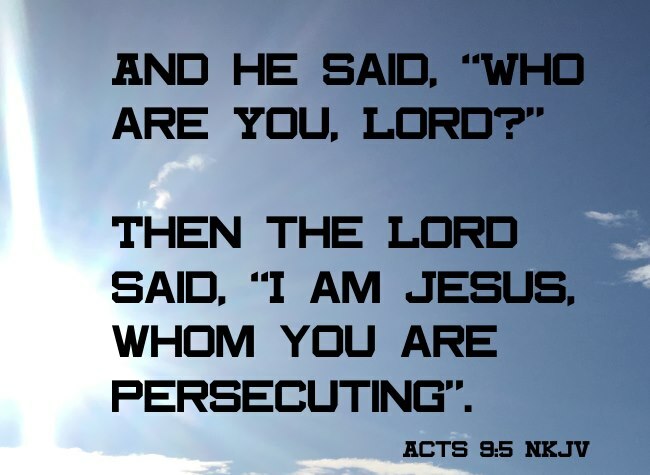 Rescued from their violence by the Roman commandant, he was conveyed as a prisoner to Caesarea, where, from various causes, he was detained a prisoner for two years in Herod's praetorium (Acts 23:35). "Paul was not kept in close confinement; he had at least the range of the barracks in which he was detained. There we can imagine him pacing the ramparts on the edge of the Mediterranean, and gazing wistfully across the blue waters in the direction of Macedonia, Achaia, and Ephesus, where his spiritual children were pining for him, or perhaps encountering dangers in which they sorely needed his presence. It was a mysterious providence which thus arrested his energies and condemned the ardent worker to inactivity; yet we can now see the reason for it. Paul was needing rest. After twenty years of incessant evangelization, he required leisure to garner the harvest of experience...During these two years he wrote nothing; it was a time of internal mental activity and silent progress" (Stalker's Life of St. Paul). At the end of these two years Felix (which see) was succeeded in the governorship of Palestine by Porcius Festus, before whom the apostle was again heard. But judging it right at this crisis to claim the privilege of a Roman citizen, he appealed to the emperor (Acts 25:11). Such an appeal could not be disregarded, and the apostle Paul was at once sent on to Rome under the charge of one Julius, a centurion of the "Augustan cohort." After a long and perilous voyage, he at length reached the imperial city in the early spring, probably, of A.D. 61. Here he was permitted to occupy his own hired house, under constant military custody. This privilege was accorded to him, no doubt, because he was a Roman citizen, and as such could not be put into prison without a trial. The soldiers who kept guard over the apostle Paul were of course changed at frequent intervals, and thus he had the opportunity of preaching the gospel to many of them during these "two whole years," and with the blessed result of spreading among the imperial guards, and even in Caesar's household, an interest in the truth (Philippians 1:13). His rooms were resorted to by many anxious inquirers, both Jews and Gentiles (Acts 28:23,30,31), and thus his imprisonment "turned rather to the furtherance of the gospel," and his "hired house" became the centre of a gracious influence which spread over the whole city. According to a Jewish tradition, it was situated on the borders of the modern Ghetto, which has been the Jewish quarters in Rome from the time of Pompey to the present day. During this period the apostle wrote his epistles to the Colossians, Ephesians, Philippians, and to Philemon, and probably also to the Hebrews. This first imprisonment came at length to a close, the apostle Paul having been acquitted, probably because no witnesses appeared against him. Once more he set out on his missionary labours, probably visiting western and eastern Europe and Asia Minor. During this period of freedom he wrote his First Epistle to Timothy and his Epistle to Titus. The year of his release was signalized by the burning of Rome, which Nero saw fit to attribute to the Christians. A fierce persecution now broke out against the Christians. Paul was seized, and once more conveyed to Rome a prisoner. During this imprisonment he probably wrote the Second Epistle to Timothy, the last he ever wrote. "There can be little doubt that he appeared again at Nero's bar, and this time the charge did not break down. In all history there is not a more startling illustration of the irony of human life than this scene of Paul at the bar of Nero. On the judgment-seat, clad in the imperial purple, sat a man who, in a bad world, had attained the eminence of being the very worst and meanest being in it, a man stained with every crime, a man whose whole being was so steeped in every nameable and unnameable vice, that body and soul of him were, as someone said at the time, nothing but a compound of mud and blood; and in the prisoner's dock stood the best man the world possessed, his hair whitened with labours for the good of men and the glory of God. The trial ended: the apostle Paul was condemned, and delivered over to the executioner. He was led out of the city, with a crowd of the lowest rabble at his heels. The fatal spot was reached; he knelt beside the block; the headsman's axe gleamed in the sun and fell; and the head of the apostle of the world rolled down in the dust" (probably A.D. 66), four years before the fall of Jerusalem.